Nutrition could be one means of reducing cattle’s methane production. As methane traps 18 times more heat in the atmosphere than carbon dioxide, there was a drive to decrease methane from human activity worldwide and it was inevitable farming would come under the spotlight, suggested Jennifer Flockhart, of Scotland’s Rural College, speaking at a recent SRUC dairy research day. Methane is produced in the rumen of the cow under anaerobic conditions. Within the rumen there is a large population of microscopic organisms including bacteria, protozoa, archaea and fungi. 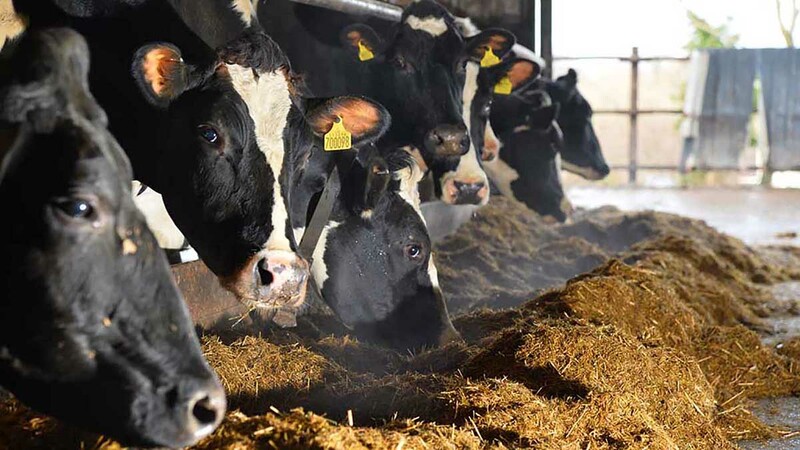 These microbes ferment feed material in the airless conditions of the rumen to produce volatile fatty acids, which are the major source of energy for the cow. Fermentation is a two-stage process, firstly producing hydrogen and carbon dioxide, then methane aided by the rumen’s archaea. “But how do we decrease the level of methane produced without harming the cows, reducing production or incurring significant costs?” asked Ms Flockhart. “Nutrition is a means which could be used to reduce the levels of methane produced by cows. A few ideas have been considered, some of which are already happening in Scotland. Distillery and oil co-products also tend to be quite high in protein meaning there is a natural ceiling of how much can be included in the cow’s diet. The man-made 3-NOP molecule inhibits the action of the archaea, preventing the second stage of fermentation, decreasing methane production. Cattle’s methane production often comes up in the wider media, as well as consumers’ concerns of cows not being let to graze, but research confirms grazing actually produces more methane than feeding cows an indoor ration containing a mixture of forage with concentrate feeds which can also increase milk production. This was demonstrated in a study using a laser methane detector which can be used to measure the amount of methane emitted from an animal in its breath. She says: “In the future, selecting sires for reduced methane production could be a reality. Rather than being anxious about reducing greenhouse gas emissions from livestock, be reassured we are working to find ways of reducing methane levels, before the spotlight reaches our industry."